We’d love your help. Let us know what’s wrong with this preview of Adder and Willow by Sam Burns. To make matters worse, when he finds and helps two strangers stuck on the road, Fletcher Lane has a problem. His boyfriend’s parents are coming for a visit, and they want to meet up. He’s ready to commit, so what happens if his prospective in-laws don’t like him? And how is he supposed to keep Rowan Harbor’s unique nature a secret when he might be the worst liar ever born? To ask other readers questions about Adder and Willow, please sign up. Oh, this one is now my favorite in the series! I love Fletcher and Conner so much! Single POV, Adder and Willow ties off some threads while creating even more. There's plenty of action, some heartbreak, and a lot of changes coming to Rowan Harbor. Strap in, y'all! This isn't going to be easy. Note: This is not a standalone, the series should be read in order. The Rowan Harbor Cycle is a series of 9 books - a trilogy of trilog So good! Note: This is not a standalone, the series should be read in order. The Rowan Harbor Cycle is a series of 9 books - a trilogy of trilogies. The main characters (Devon and Wade, Jesse and Sean, Fletcher and Conner) will have their own book in each trilogy with happy for now endings until the final trilogy where they will finally (hopefully) get their happily ever afters. If I had to put in words exactly why I love this series so much, I think I would have to say because - for all the paranormal and urban fantasy aspects of it - at its heart, this is a series about finding yourself. For Fletcher, it's realising that he can be worried about his life without it becoming an overwhelming fear. It's also about acceptance, acceptance that when Conner says he loves him, he truly does mean it forever. The supernatural suspense elements are always intricately woven into the If I had to put in words exactly why I love this series so much, I think I would have to say because - for all the paranormal and urban fantasy aspects of it - at its heart, this is a series about finding yourself. The supernatural suspense elements are always intricately woven into the rest of the narrative too. Here it feels, possibly rightly so as we hit the final run of the nine book series, that all the pieces are being put into place for the grand finale. I love every thing about this series, it's quirky, it plays with the tradition paranormal tropes and subverts them and, while there are powerful magical people and creatures, none are used as a Deus Ex Machina. This is the sixth book in the Rowan Harbor Cycle series and is the ending of the second “chapter” of Rowan Harbor’s struggle. In the first three books, the evil was more disorganized and required the younger citizens of Rowan Harbor to step up and take their places on the Council. The next three books show us how Devon, Jesse, and Fletcher are maturing, learning to use their powers and becoming the leaders they were meant to be. Fletcher and Connor are a cute coupl A Joyfully Jay review. Fletcher and Connor are a cute couple, and I enjoy watching the characters grow both together and individually. We see less of the others on the Council, in this book, as much of the story takes place between the attack on Rowan Harbor and the efforts to defend it, and the careful dance between Fletcher, Connor, and Connor’s parents. I think this was a good ending to the second trilogy, giving us a bit of a breather and a happily for now until the next three books and the next villain. I’m curious as to what’s going to happen with Oak, now that Fletcher is able to bond with and perhaps speak for the forest around Rowan Harbor. I can’t wait for the next book in this series! This series just keeps getting better, with every new book the author releases. 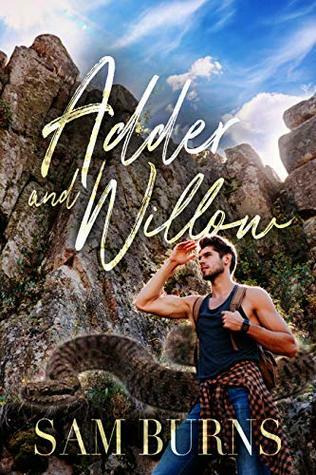 Adder And Willow is the 6th book in the series, and the third book of the 2nd trilogy, in which we catch up with Fletcher and Conner, whose relationship is still growing. Now Conner's mother and step-father are coming to visit, and Fletcher is dreading meeting them. Not because he doesn't want to meet his boyfriend's parents, but because he's a terrible liar, and he knows that he's no good at keeping secrets. And the supernatural parts of himself and Rowan Harbor must be kept secret from outsiders. Fletcher is also having meetings with Oak, the Dryad, who have been working with Fletcher to continue the training his mother couldn't. It is during one of these meetings that Fletcher finds out something he may have already sort of known, but that might put his future with Conner in danger. And, as if that isn't enough on his plate, he also stumbles across two strangers in a stranded car, a mother and son, who are intrinsically linked to Rowan Harbor. I just adore this series. The characters are complex and fully fleshed out, and each one is so different. There is never any confusing one character with another, because they all have different personalities. Fletcher may be one of my favorites, because while he's timid to some extent, and not assertive, he has much more steel in his backbone than he realizes. Conner is still growing into his new powers (you'll have to read the previous book to find out about that), and he's going to be tested here. What also stands out about the characters is how they're all connected - not only because of their supernatural powers, but also because they feel like family, and they treat each other that way. They stick together, they stick up for each other, and they work together for the common good. The book is alternately humorous and serious. There is action, there is danger, and there are sweet moments between Fletcher and Conner that really cement their relationship. This series cannot be read out of order - each subsequent book builds on its predecessor - however, each book does end in a satisfying way. There are no cliffhangers. The writing style of this author really works for me, and I flew through the pages. Closing out the second trilogy in this nine-book cycle, Adder and Willow brings the story back around to focus on Fletcher Lane and Conner Mason. With everything that has gone wrong lately in Rowan Harbor, you’d think that Fletcher would have enough to worry about. And he does. There is some crazy man out in the world trying to wipe Rowan Harbor off the map, Fletcher barely has a grip on his shifting abilities, and Oak has been hinting that if his powers continue to grow he might be tied to the t Closing out the second trilogy in this nine-book cycle, Adder and Willow brings the story back around to focus on Fletcher Lane and Conner Mason. With everything that has gone wrong lately in Rowan Harbor, you’d think that Fletcher would have enough to worry about. And he does. There is some crazy man out in the world trying to wipe Rowan Harbor off the map, Fletcher barely has a grip on his shifting abilities, and Oak has been hinting that if his powers continue to grow he might be tied to the town for the rest of his life. And that is not even factoring in Conner’s parents–who don’t know about the magical world, and hence the real reason their son decided to drop his old life in San Francisco and move to a strange small town in Oregon–who are set to arrive in only a matter of hours for the weekend. So, of course, disaster strikes. Again. And this times it could do much more damage than anything the town has faced before. Through all the ups and downs of this series, I have come to really care for these characters of Rowan Harbor. Each book has only added to the story and expanded the characters. I love picking up each new book unsure what the story will hold, but certain it will drag my yet further in love with everyone. While I don’t think this one will go down as my favorite, I still greatly enjoyed it. Fletcher is always a pleasure to read about, and his flustered nature when he is around Conner’s parents is just too adorable. We didn’t get nearly as much time with Conner as I would have preferred, but he still put in a good performance when on page. Him and Fletcher are such a good match. However, I’m not sure why, but the danger in this book never really felt as intense as it should have. Which is probably why I didn’t connect as much as I could have to the story. The stakes were high, but there was something missing. I’m not sure what, though. Maybe a more personal threat? It wasn’t like Fletcher and Conner were safe…but maybe it was one-step too removed for me. I don’t know, it could just be I was too distracted while reading. That’s not to say I didn’t enjoy this. It was still a very good story, and I’m still very interested in where this series will go in the final trilogy. The characters and the town only grow more interesting with each new book, so I’m anticipating a truly enjoyable experience as things come to a final head. Fletcher is adorable as ever!! I loved how he worried about meeting Conner's parents *grin*. This is the 'last' book of the second trilogy of The Rowan Harbor Cycle (we have 3 more books!). We discover who has been giving warnings to the residents ((view spoiler)[It's Devon's step-father's wife and her son (hide spoiler)]. We have another casualty of the Rowan resident ((view spoiler)[Goodbye, Madam Cormier (hide spoiler)]). And we have darling Fletcher stepping up his game ((view spoiler)[he finally accepted the training from Oak, which will make him connected thoroughly with the town and won't be able to leave (hide spoiler)]). Was it because it was about my favorite couple of this series or because it was quite a straight forward story without much distraction or sub plots that it felt kinda short? Still undecided if I should rate it 3.5 rounded up to 4 or down to 3 because yes, I enjoyed it and it's not so bad if the focus is solely on Fletcher and Connor and their growing into their abilities but it felt as soon as the threat to Rowan Harbor started it was nearly already solved. I love this series and Fletcher is my favorite character! Things start to escalate in this one. And among all those things Fletcher has to meet Conner's parents while everything gets out of control. A nice surprise, more people arriving in the town, the guys start accepting things and trying to save the people and the town. The battle is far from over. Don't worry, this book isn't really about snakes per se, no one changes into one (if that freaks you out) lol. This story is about Fletcher Lane,(Shapeshifter) and Conner Mason (new found witch). Fletcher is freaking out because Conner's parents are coming to town. The morning of Fletcher is restless so he shifts and goes for a run. In the forest something odd happens and he finds some unexpected guests. Then Conner's parents show up and pretty much all hell breaks lose. Fletcher is also learning new things from Oak and the town is starting to rely on Fletcher a little more. This book is also sad, and while I am sad about it, I'm also happy they've gained some new characters and Fletcher a new roommate,and no, it's not Conner. I wonder if the new guests are meant for Salli. I guess we'll find out. And you may wonder what kind of pet name Chouchou is, it's French and literally means pet. And I think you'll love him (her? ), Sorry,I don't think it said. Anyways, this is a great addition to the series. I believe there's 3 left and I'm excited we're drawing near, but also sad because I love this little town. This one centers around Fletcher and his boyfriend Connor who end up being crucial to stopping a madman destroy Rowan Harbor and quite possibly the better part of the west coast. Love this series. And these guys are still my favourite couple. Can't wait for book 7. Adder and Willow is the 6th book in the Rowan Harbor Cycle series. This is a true series where each book must be read in order for the most reading enjoyment. There's no secret from my previous reviews, that I absolutely love this ongoing series by Sam Burns. Each book is continuing the story of these three tightly interwoven couples along with their small magical town. Adder and Willow is the second book to focus on Fletcher and Connor's relationship and their part in the bigger storyline. While I'd love to share bits of the story, it would really give way too much away of the plot. This book, actually this whole series, is one that needs to be read to give the reader the true impact of the story. What I can say about this book though, is that it's just as well written as the previous five books, and it moves the story further along to the finale in the future books. It also advances the relationship between Fletcher and Connor, along with showing Fletcher growing more confident in himself. There's quite a bit of action, along with the magic that is the heart of the residents and the town itself. The story in Adder and Willow will keep you on the edge of your seat till the very last page. This series just gets better and better with each new installment and I think Adder and Willow was my favorite so far. It wasn't only the connection between Fletcher and Connor, which was amazing, btw, it was how detailed the writing is, weaving a fantastic paranormal/urban fantasy plot with interconnected storylines that has been growing in these 6 first books and that I am looking forward to seeing how it will play out in the last 3. There are a lot of recurring characters aside from t 5 Stars! There are a lot of recurring characters aside from the three main couples, of which we've been learning about throughout the series, and yet, I've never felt lost, that's something I truly appreciate. I loved seeing Fletcher finally find his real place in the town and even if I don't want to give anything away, please know that this book was captivating and fun and action-packed! You definitely don't want to miss out on this series. Fletcher is still not comfortable with his abilities. Oak is teaching him, opening up Fletcher to the possibilities of his gift. Falling in love with Connor was scary but meeting Connor’s parents is terrifying. He rescues a boy and his mother, bringing more trouble to Rowan Harbor, but also the answer to some important questions. The town must work together as the next crisis overtakes Rowan Harbor. As the town loses an important member Fletcher learns just how necessary his untried powers are. An Fletcher is still not comfortable with his abilities. Oak is teaching him, opening up Fletcher to the possibilities of his gift. Falling in love with Connor was scary but meeting Connor’s parents is terrifying. Another good addition to the series. These characters are more defined in every story. I enjoy how each person has their own role to play but how interwoven they all are to the safety of the town. They really need to be read in order to get the full impact of the story. This series is without doubt only enjoyable if you know the other books in the series, otherwise you’re lost. Those who were there from the start might be as engrossed as I am and the more we get to know the more thrilling it gets. In this particular book of the series the focus lies on Flatcher and the second trilogy of three in total comes to an conclusion. I really loved how in this book a domestic, daily thing is combined with the freaky events around Rowan Harbor. The book isn’t always a light one but it’s also not only serious. I really loved how well known the characters are, the side characters are really warming your heart too but on the other hand, although the reader followed the journey now for a few books, it’s still a mystery what happening in Rowan Harbor, the character still have secrets they hide or are forced to face new challenges. I’m really looking forward what author Sam Burns has in her sleeve for us and I hardly doubt it will be a smooth journey for our nice crew. This was good. I'm not sure how many books of the same format I want to read though. It is getting boring to read about the same stuff over and over. I can't imagine what could possibly happen in 3 more books! I hope that all the drama gets solved and the evil doers move on. What I liked in this book was we gained some more insight into how the magic works. I still like connor and fletcher. Bring on the third trilogy! Loved it. It was a great read. Filled with action and the paranormal. Waiting for this book was killer. Now we wait again. But because it is so fun to read. Write fast Sam! Fast paced, exciting, thrilling, and any other adjective you can spout...excellent read. Riveting to the end...anxious for more from Rowan Harbor and the characters I've embraced. This book is about a town full of supernatural being 's who are being hunted by human hunters . Another fantastic addition to this series I truly love these characters I'm looking forward to the next installment of this series because we all know that Burt is not read . Something about Fletcher is very endearing to me. I find his stories to be slightly more compelling than from the other two. I loved everything, as always we this series. Can't wait for the next book, since this one passed something so monumental, in this universe.